"Bob Hope Presents The Chrysler Theatre" was one of television's last attempt at a quality anthology series. However,this was one of the last anthology series to came out of the 1960's. The Chrysler Theatre was a mixed bag of sorts all wrap up into a very impressive hour long series. You have a mixed bag of drama,espionage,westerns,comedies not to mention musical and "event" specials,all involving Bob Hope in one role or another. However besides Bob Hope as the host,The Chrysler Theatre featured some big-name guest stars,impressive full color photography,and a much higher production budget than those offered in the classic black-and-white anthology series of the 1950's such as "Playhouse 90",and "General Electric Theatre". But those series tended to feature dramas of stark realism featuring protagonists with whom the audience could identify with. "Chrysler Theatre",along with another successful anthology series from the early 1960's "Suspense Theatre",had a penchant for espionage suspensers and noir crime dramas,featuring characters unlike anybody the viewers were ever likely to meet. 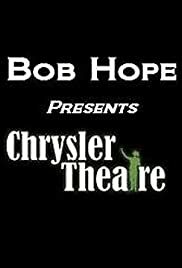 Bob Hope,the nominal host of this series and at the beginning of each episode would strut out in front of the Chrysler PentaStar logo(which was the show's sponsor)and make a few comments about the story we are about to see. After the epilogue,he would return to make a few comments about next week's story. This was however another fine anthology series produced by Universal Television and under the guidance of Roy Huggins who served as executive producer of this series along with Richard Berg, Frank P. Rosenberg,and Jack Laird. 107 episodes were produced in full color and it ran for four seasons for NBC-TV from October 4,1963 until May 17,1967 for Hovue Productions and Universal Television. The program ifself was a landmark chapter of television history. Among some of the memorable episodes of Chrysler Theatre were"One Day In The Life of Ivan Denisovich",starring Jason Robards; "The Seven Little Foys",starring Mickey Rooney, Eddie Foy,Jr.,and the Osmond Brothers,and "Think Pretty",a musical starring Fred Astaire and Barrie Chase. Other episodes included "Gulity or Not Gulity",starring Robert Ryan,and "Have Girls Will Travel",starring Aldo Ray. Some of the episodes were presented live and in color which includes the classic "Murder at NBC",which stars not only Bob Hope but with special guest stars Frank Sinatra,Bill Cosby,Dean Martin and James Stewart. In the four years that this show was on the air,performers who starred in at least two of the episodes in this series were Peter Falk,Jack Lord,Hugh O'Brien,Shelley Winters,John Cassavetes,Robert Stack,Dina Merrill,Leslie Nielsen,Darren McGavin,Angie Dickinson,Broderick Crawford,and Stuart Whitman. Others included William Shatner,Jack Klugman,Janet Leigh,Suzanne Pleshette,Carroll O'Connor,Dana Wynter,and Ernest Borgnine. Another fine series from Roy Huggins,the man who brought you "Maverick","77 Sunset Strip","The Fugitive",and "Kraft Suspense Theatre","Run For Your Life",and "The Rockford Files".